Turkey’s Aegean shores are among the loveliest landscapes in the country. The magnificent coastline, lapped by the clear waters of the Aegean Sea, abounds in vast and pristine beaches surrounded by olive groves, rocky crags and pine woods. Dotted with idyllic fishing harbours, popular holiday villages and the remains of ancient civilisations attesting to the inheritance of more than 5,000 years of history, culture and mythology, this region. offers a holiday with something for everyone – nature lovers, sun worshippers, photographers, sports-enthusiasts, sailors and archaeologists. Along the whole length of the coast, accommodations to suit every taste and price range can be found. Known in Turkish as “Beautiful Izmir”, the city lies at the head of a long and narrow gulf furrowed by ships and yachts. The climate is mild and in the summer the constant and refreshing sea breezes temper the sun’s heat. Behind the palm-lined promenades and avenues which follow the shoreline, the city, in horizontal terraces, gently ascends the slopes of the surrounding mountains. The third largest city in Turkey, Izmir’s port is second only to Istanbul’s. A cosmopolitan and lively city all year round, during the International Arts Festival (June/July) and the International Fair (August/Sept), Izmir bursts with an added vibrancy. The original city was established in the third millennium B.C. (at present day Bayrakli), and at that time shared, with Troy, the most advanced culture in Western Anatolia. By 1500 B.C. it had fallen under the influence of Central Anatolia’s Hittite Empire. In the first millennium B.C. Izmir, then known as Smyrna, ranked as one of the important cities of the lonian Federation; during this period – one of the city’s most brilliant – it is believed that Homer resided here. The Lydian conquest of the city, around 600 B.C., brought this period to an end, and Izmir remained little more than a village throughout the Lydian and the subsequent 6th century B.C. Persian rule. In the fourth century B.C. a new city was built at the instigation of Alexander the Great on the slopes of Mt. Pagos (Kadifekale). Izmir’s Roman period, from the first century B.C., gave birth to its second great era. Byzantine rule followed in the fourth century and lasted until the Seljuk conquest in the 11th century. In t415, under Sultan Mehmet Çelebi; Izmir became part of the Ottoman Empire. The Archaeological Museum , near Konak Square, houses a superb collection of antiquities including the statues of Poseidon and Demeter which, in ancient times, stood in the Agora. Neighbouring the Archaeology Museum, the collection in the Ethnography Museum contains folkloric artifacts, which includes a fine collection of Bergama and Gördes carpets, traditional costumes and camel bridles. Situated on Atatürk Caddesi, in an old Izmir house used by the founder of the Turkish Republic, the Atatürk Museum exhibits photographs of the leader as well as some of his personal effects. The Fine Arts Museum, located in Konak, displays the works of famous Turkish painters. The Selçuk Yasar Art Museum is a private museum on Cumhuriyet Bulvari with a collection of 20th-century Turkish art. The Natural History Museum in Bornova attracts as a natural reserve of the Aegean Region landscapes’ historical preservation. The Ödemis Archaeological Museum is about 60 km east of Izmir and displays regional artifacts. The Tire Archaeological Museum is about 50 km east of Izmir. The Agora, or marketplace, in the Namazgah Quarter was originally constructed during the rule of Alexander the Great. What remains today, however, dates from the rebuilding under Marcus Aurelius after a devastating earthquake in 178 A.D. The Sirinyer and Yesildere Aqueducts , two examples of Roman engineering which span the Meles River, supplied Izmir’s water throughout the Byzantine and Ottoman eras. me Saint Polycrap Church remains are of the oldest church in Izmir, and symbolise the Seven Churches of the Apocalypse community. Saint Polycarpo was martyred at Kadifekale by the Romans in 155 A.D. According to legend, when they tried to bum him, the flames wouldn’t touch him and they finally stabbed him to death. The church was reconstructed in 1620 by Süleyman the Magnificent. An 18th century Ottoman inn, the Kizlaragasi Han, a fine example of the architecture of the period, is being restored to its former glory. The symbol of Izmir, the Saat Kulesi, or Clock Tower, stands in Konak Square – the heart of the city. A gift from the Sultan Abdülhamid, and built in 1901, it is decorated in an elaborate; late-Ottoman style. Restored old houses fill the old Asansör quarter, also known as the Jewish quarter. In this quarter, Dario Moreno Sokagi is the main pedestrian street to the Asansör, an elevator from the 19th century which is fifty-one meters in height, and provides access between the lower and upper streets. Situated on the upper side, the Asansör restaurant offers a beautiful view of Izmir. If you find yourself on Havra Sokak in Kemeralti, notice the old buildings and synagogues. In the center of Cumhuriyet Meydani, or Republic Square, stands the Atatürk Monument, an impressive statue of Atatürk sitting on a horse and facing the sea. Erected in 1933, the Monument commemorates the liberation of the city by Turkish Forces. Standing in Karsiyaka, The Flying Dolphins is a monument that symbolises friendship and brotherhood. Hisar Mosque is the largest and oldest in Izmir. Built in the 16th century, with restorations in the 19th century, it has a delightful interior with an interesting mimber (pulpit) and mihrab (attar). Other mosques in Izmir are Salepçioglu (20th century), Sadirvan (17th century with 19th-century restorations) and Kemeralti (17th century); all are situated close to the Kemeralti Quarter. Kültürpark, the main park of the city, offers many different activities. ft is the site for the International Izmir Fair and contains an amusement park, zoo, restaurant and quiet gardens. Olaf Palme Park, situated in Karsiyaka, is a relaxing place to stop. It also offers some sports facilities. Next door, Adnan Saygun Park, a center for artistic activities, contains an amphitheatre for concerts and theatrical productions, and also the Open-Air Museum Park, which has statues scattered throughout the grounds. Insan Haklari (Human Rights) Park has lovely modem statues, including the huge Flying Dolphin Monument. 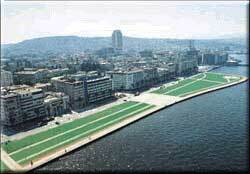 Muammer Aksoy Park is a lovely seaside park with a nice view of Izmir Bay. Turgut Özal Recreation Park, located in Bayrakli, offers a number of recreational and sporting activities. Izmir International Fair, which is an international amusement and industry show, opens each year in August. Take a horse-drawn carriage along the promenade during the day; afterwards spend the evening absorbing the lively atmosphere of the bars and cafes around Passport Pier. In the streets of the Kemeralti Market area, it is possible to find fascinating antiques, both fine and fun jewellery, a great variety of clothing, and the dried figs and sultanas for which Izmir is famous. The fish restaurants in this colorful area serve up local specialities; trança and çipura, two types of sea bream. The best modern and most elegant shops line the Kordon Promenades in Alsancak, Karsiyaka and Cumhuriyet Avenue. Balçova, on the road to Çesme, is one of Turkey’s largest thermal spas, with excellent facilities for guests. Çamalti, 15 km west of Karsiyaka, is an area of coastal marshes and salt fields that is preserved as an important bird sanctuary – the Izmir Bird Paradise. Enthusiasts can spot many species, including flamingos and pelicans. The Yamanlar Çamligi, a pine forest near the lovely Karagöl Lake, 40 km northeast of Karsiyaka, is a popular picnic spot that also provides restaurants and a swimming pool. A Hittite bas-relief is carved into the rock at Kemalpasa (20 km from Izmir) which lies in the Karabel Pass. On the highest point above Izmir, Belkahve overlooks the Gulf of Izmir and is a relaxing spot to enjoy a cup of Turkish coffee. A favourite haunt of Atatürk’s, it is now the site of the largest statue in his honour. The Çesme Peninsula, lapped by the waters of the Aegean Sea, lies west of Izmir. The name ‘Çesme’, meaning fountain, refers to the many springs found in the area during the 18th and 19th centuries. It is one of Turkey’s most beautiful stretches – surrounded by clear blue sea, with landscapes of cultivated fields of aniseed, sesame and artichokes dotted with fig and gum trees. In the unspoiled bays you can swim in absolute peace. Visitors will find excellent holiday accommodations, restaurants, sports and entertainment facilities. A 14th century Genoese fortress, restored and enlarged by the Ottomans in the 16th century, dominates the small port of Çesme, 80 km from Izmir. Today the town is a popular holiday ‘ resort with excellent accommodations and restaurants. The 16th century caravanserai near the fortress, built by Süleyman the Magnificent, has been converted into a hotel, while the 19th century Church of Hagios Haralambos has been restored as the Emir Çaka art gallery. Thermal baths offer a health-oriented escape from modern life. Excellent shopping – the finest quality carpets, leather goods, as well as souvenir items are available. At night, a lively, fun atmosphere pervades, especially in the restaurants, cafes, bars and discos along the promenade. Yachts can be hired to explore the Peninsula’s splendid coastline. Çesme hosts an annual International Song Contest in the summer. Also, weekly ferry lines run from Çesme to Venice. ·· The very popular holiday centre of Ilica boasts an excellent white, sandy beach, and the outstanding facilities of the Altin Yunus Marina and Holiday Complex. The bay here is ideal for water sports, especially windsurfing and sailing. The thermal baths around Ilica are very popular; the best being located on Sifne Bay; Paça Limani has a campsite which offers campers comfortable facilities. In Ilica Bay, the colorful International Çakabey Optimist Yacht race is held every year in July. Ildiri, a quiet seaside village 20 km northeast of Çesme, was ancient Erythrai. Those who climb up to the Acropolis at dusk are rewarded with beautiful views as the sun sinks over the bay and islands. Nearby Gerence Gulf is a pristine inlet northeast of the Çesme Peninsula which can be reached by yacht or car. The natural surroundings offer relaxation while the bay is ideal for water sports. In Dalyan, a fishing village built on a sheltered deep water inlet just north of Çesme, some of the region’s best fish restaurants border the quay of the lively marina. Tourists are attracted by the variety of Çiftlik’s accommodations, and by a long, sandy beach (Pirlanta Plaj), just outside of town to the southwest. Camping facilities are available to the south, and nearby stretches one of the area’s best beaches, the Altinkum Plaj (Golden Beach). Windmills, some of which have been converted into attractive restaurants, dot the hill above Alaçati, a delightful and typical Aegean town. Alaçati lies to the south inland from Ilica and the coast; a couple of kilometres to the south is a good beach. Many lovely bays, accessible only by yacht, are to be found along the coast southeast of the town and ensure peaceful and relaxing anchorage in this popular sailing region. Known in ancient times as Clazomenae, Urla Iskelesi offers a marina as well as plentiful accommodation in all price ranges. Restaurants on the top of Güvendik hill afford a marvellous view of the bay and its islands. The prosperous little fishing village of Çesmealti is notable for its simple yet excellent fish restaurants. As you drive along the panoramic Karaburun Peninsula coast road you pass several peaceful bays and quaint fishing villages: Balikliova, Mordogan and Karaburun. At Karaburun, pleasant hotels, tea gardens and fish restaurants sit between the beautiful mountain backdrop and the clear, clean water. From Manastir Mountain, you can enjoy an unforgettable view of the Karaburun coast, the Foça coastline opposite, and the entrance to the Gulf of Izmir. On the southern side of the Çesme Peninsula, near the town of Seferihisar, is the small picturesque marina of Sigacik. This important yachting centre is surrounded by fortifications dating from the Genoese period and is a good point from which to visit the Temple of Dionysus at the antique site of Teos as well as the lovely Akkum beach. Gümüldür has excellent tourist facilities – beautiful beaches, restaurants and hotels. Near Ahmetbeyli (Claros) to the east, stands the Apollo Temple and the remains of the colossal statue of Apollo; here you can also enjoy a good fish meal or a swim at the town’s wide beach. A winding panoramic coastal road leads from Ahmetbeyli south to Pamucak beach. The ancient Phocaea, Foça once formed part of the lonian Federation. Today it is a modern, lively holiday town on two deep bays. The pleasant accommodations, clean beaches and inviting restaurants make it an attractive holiday spot. Those seeking the perfect tan can find it on the natural rock terraces of Siren Islands. Bergama (Pergamon), once a great center of culture, survives as one of Turkey’s finest archaeological sites. In the Acropolis, on a hill above the modern town, are the remains of the celebrated library, a steep and impressive theatre, the temples of Trajan and Dionysus, the monumental altar of Zeus, the sanctuary of Demeter, a gymnasium laid out on three terraces and the Agora. The Asclepion, located to the southwest of the lower city, was a sanctuary dedicated to the god of health, Asclepios. In town, visit the Archaeological and Ethnographical Museum; nearby, is the site of a temple dedicated to Serapis, becoming one of the Seven Churches of the Apocalypse, and subsequently converted by the Byzantines into a basilica. Dikili, frequented by cruise liners bringing visitors to Pergamon, is Bergama’s harbour town. It offers a relaxing atmosphere with many pleasant restaurants lining the Kordon Promenade. A stop at the little port of Çandarli, the ancient Pitane, is recommended in order to see the Genoese fortress, one of the best preserved in Turkey. Ayvalık is a charming port, situated amid beautiful pine woods. Nearby, the Seytan Sofrasi (Devil’s Table) offers a splendid panorama of the archipelago along the Gulf of Ayvalık and the little island of Alibey (Cunda), where there are pleasant seafood restaurants. Sarmisakli Beach is one of the most beautiful beaches in the area. The Gulf of Edremit, also known as the Olive Riviera, has a number of charming seaside resorts: Küçükkuyu, Altinoluk, Akçay (a thermal center with numerous springs), Edremit and Ören, all with beautiful beaches, ring the Gulf of Edremit and offer visitors a wide choice of hotels and guest houses with views of the sea. Also, situated here is the beautiful Kaz Dagi National Park , with magnificent landscapes, restful green areas and several hot springs. According to mythologies it was in this area that the world’s first beauty contest was held. Under the shadow of Kaz Dagi (Mt. Ida, 1.774 meters) in Pinarbasi, west of Akçay, Paris gave the golden apple to Aphrodite in the famous “Judgement of Paris”. 87 km south of Çanakkale in Ayvacik Province is Assos, the famous teaching center of antiquity. Aristotle, Plato’s most famous student, was invited to Assos and spent over three years living and teaching there. He married the niece of Hermeia, founded a school of philosophy and conducted his early exploratory work in zoology, biology and botany. The acropolis of Assos is 238 meters above sea-level, and the Temple of Athena was constructed on this site in the 6th century B.C. This Doric temple is being restored to its former glory and role as guardian of the Biga Peninsula and Edremit Gulf. Linger to see the moonlight scattered through the temple ruins, or rise early for the gentle awakening of dawn over the acropolis, from the top of which you can take in the magnificent vista of the Gulf of Edremit; and you will appreciate why this heavenly location was chosen. On the terraces descending to the sea are agoras, a gymnasium and a theatre. From the northern comer of the acropolis, you can see a mosque, a bridge and fortress, all built in the 14th century by the Ottoman Sultan Murat I. Below lies a tiny and idyllic ancient harbour. Assos has gained the reputation of being the center of the Turkish art community with its lively, friendly and bohemian atmosphere. This may be the holiday you will remember for years to come. The city of Çanakkale lies at the narrow, 1,200-meter entrance to the Çanakkale Strait that connects the Sea of Marmara and the Aegean. Passenger and car ferries run daily between Çanakkale, on the Asian side, and Eceabat and Kilitbahir; on the European side. Yachts navigating the straits stop at the well-equipped Çanakkale Marina to allow tourists more time in the area. Hotels, restaurants and cafes along the promenade offer a place to enjoy the comings and goings of the harbour, and views of the Kilitbahir Fortress and the Çanakkale Archaeology Museum. In 1451, Sultan Mehmet II, later the conqueror of Istanbul, built one fortress on the European side of the Çanakkale Strait, at Kilitbahir, and one on the opposite shore at Çimenlik, to control the passage of ships through the strait. Today the Çimenlik fortress serves as a military museum dedicated to the Çanakkale Battle of 1915, one of the most celebrated of World War I. To honour the 500,000 soldiers who lost their lives at Gelibolu (Gallipoli), the peninsula was made into the Gelibolu Historical National Park. It includes memorial monuments, the Ariburnu Cliffs and Tuz Lake. The beauty of the green hills, sandy beaches and blue waters provides an honoured resting place for the soldiers who bravely fought and died in this historic battle. You cannot help but sense the heart of the Turkish nation, in the special spirit of this place. Homer immortalised Truva (Troy) in the stories of King Priam, Hector, Paris and the beautiful Helen. Archaeological excavations have revealed nine separate periods of settlement and the ruins of city walls, house foundations, a temple and a theatre. A symbolic wooden Trojan horse commemorates the legendary war. As you approach Bozcaada Island, the Venetian castle commands your attention. Then, your eyes are drawn to the glistening white houses and the restaurants and cafes which line the promenade. Wine seems as plentiful as water on this island; a circuit reveals many vineyards and wine cellars. There are good, sandy beaches at Ayazma, Poyraz and Igdelik. The largest of the Turkish islands, Gökçeada, is ringed with pristine bays. Its hills, covered in the contrasting greens of pines and olive trees, are dotted with sacred springs and monasteries. Regularly scheduled ferryboats make the trip from Çanakkale and Kabatepe. In August, islanders and tourists gather for colorful local fairs. The town of Biga has lent its name to its whole peninsula in Bayramiç, 60 km from Çanakkale, is the 18th century Hadimogullari Mansion, (Ottoman House). Inland from the Aegean sea, the fertile soil has endured the passage of many important early civilisations. Today the remains of these cultures can still be seen in the countryside as well as in the cities, towns and villages. The more recent legacy of Ottoman rule is apparent in the well-preserved, traditional, domestic Turkish architecture, and Ottoman mosques. Leisure-resorts have been built around the region’s hot springs, and can accommodate those seeking the thermal springs’ pleasurable and beneficial effects. An attractive Aegean city, Manisa has preserved several splendid examples of Seljuk and Ottoman architecture. Endowed by Ayse Sultana, mother of Süleyman the Magnificent, the Sultan Mosque was built early in the 16th century. Every year in April, on the grounds of this mosque, a festival is held celebrating Mesir Macunu, a sticky imperial elixir that reputedly cured the sultan’s ailing mother. The 16th century Muradiye Mosque was designed by the great architect Sinan and the adjacent medrese, or theological college, today houses the Archaeological Museum. September sees the annual Harvest Festival begin when the fruit of the vineyards are brought in with great celebration. The region’s numerous vineyards produce grapes, dried for export. South of the city lies the Sipil Dagi National Park, home of the famous “crying rock” of Niobe. If you travel to the northeast you come to Gördes, a pleasant town particularly known for its fine carpets. The ruins of ancient Sart (Sardis), once the capital of the Lydian realm of Croesus, lie on the Sart Çayi (Pactole River). Here the first coins were minted. The Temple of Artemis and a restored gymnasium testify to the city’s past splendour, as does the important third-century A.D. synagogue. On the south side of Sardis, Mt. Boz offers trekking and other mountain sports. On its south slope, in the village of Birgi, is the Çakir Aga Mansion, a fine example of traditional Turkish architecture. Historically, Usak was an important, carpet weaving center, a role it continues to play today. Tourists find the Archaeology Museum informative and interesting. The Kaftanci House Museum, with the Atatürk Ethnography Museum, displays wonderful Usak carpets and kilims; Atatürk resided here. An inaccessible and imposing citadel dating to Byzantine times overlooks this provincial city. The Archaeological Museum and the War of Independence Memorial reveal Afyon’s place in history. Monumental bas-reliefs, a legacy of the Phrygian Kingdom, are carved into rock faces on hills north of the city. Aslantas is the largest. At Aslankaya, lion reliefs are engraved into the sides of the rock. The Açik Hava Müzesi (Open-Air Museum) is near the north entrance of the town of Dinar, 100 km south of Afyon. This is the site of the legendary music contest between Apollo and Manyas (Pan). Byzantine and Roman gravestones, inscriptions and statues can be seen here. Kütahya City is one of the oldest Turkish cities, with Turkish traditions still being practiced today and important Ottoman architectural monuments, including a castle, mosques, medreses, baths, complexes, mausoleums, and mansions. One of the finest mosques is the 14th century Ulu Mosque. Kütahya Castle offers a wonderful, panoramic view of the old town on the western side of the city. The Kütahya Archaeology Museum was a medrese in the 14th century; it now displays ethnographia, Roman and Byzantine relics, and tiles of Iznik and Kütahya from Ottoman times. Lajos Kossuth, the 19th century Hungarian hero, lived with his family in what is now the Kossuth House Museum; relics and documents related to Kossuth are displayed in the museum. The kilns of Kütahya produced exquisite ceramics in the 16th and 17th centuries – a craft which lives on today. You can visit the workshops where skilled artisans produce tiles, plates and bowls renowned for their cobalt blue patterns on a milky white background. Southwest of Kütahya, is the Roman town of Çavdarhisar (Aezani) where a theatre, stadium and the Temple of Zeus remain. In the same direction, Murat Mountain offers camping facilities and hot springs, amid delightful scenery. Near Dumlupinar are the Baskomutan National Park and the War of Independence memorials. The province’s capital, also called Aydın, enjoys a widespread reputation for its fine figs. Known as Tralleis in ancient times, it was at the center of a celebrated sculpture school. The remains seen today date from the second century A.D. After 1186 the town came under Seljuk rule, and the local museum displays artifacts from the different periods of its history. A visit to Efes (Ephesus) – once the, commercial center of the ancient world – is a highlight of any visit to Turkey. The city, whose wealth and patronage supported its splendid architectural program, was dedicated to the goddess Artemis. Her enormous temple, once considered one of the Seven Wonders of the Ancient World and rebuilt several times, dates in its latest form from the third century B.C. The ruins also include a theatre, gymnasium, agora and baths, as well as the Library of Celsius. The nearby town of Selçuk is dominated by a Byzantine citadel which stands close to the 6th century basilica of St. John built on the site of the Apostle’s tomb. The 14th century Isa Bey Mosque, next to the basilica is accessed through its typical Seljuk portal. The Archaeological Museum houses an impressive collection of statues and other finds recovered during the excavations of Ephesus. The nearby Turkish Bath Museum , built in the 16th century, shows Turkish life at the hamam (bath). The Ephesus International Festival is held annually in May. It is recorded that St. John brought the Virgin Mary to Ephesus. after the death of Christ and that she spent her last days in a small house (Meryemana Evi) built for her on Bülbüldagi (Mt Koressos). Now a popular place of pilgrimage for Christians and Muslims the house has received the official sanction of the Vatican, and Christians observe a commemoration ceremony every year on August 15th. Near Selçuk in Çamlik is a TCDD Open-air Steam Locomotives Museum. 9 km east of Selçuk is Sirince, known for its traditional 19th-century village houses, some of which have been converted into guest-houses. Wine produced in this small hillside Turkish village, which itself resembles an open-air museum. 18 km from Selçuk are wine-houses, for tasting the wines. Back along the coast, Kuşadası, or Bird Island, is a lovely port built along the shores of a glittering bay. The terraced town overlooks the most beautiful inlet of the Aegean and seems to have been created purely for the delight of the holiday-maker. Be sure to visit the famous and popular Kus shopping center in the Kaleiçi quarter, where there is nightlong entertainment. A large, modern marina facilitates life for visiting yachters. Tusan-Kustur Beach, north of Kuşadası lies one of the cleanest beaches and 23 km south of Kuşadası is the charming holiday-resort town of Güzelçamli. West of Güzelçamli and 30 km from Kuşadası, is the Dilek Peninsula National Park, and a visit is a must for those with the time. Here amidst incredibly beautiful surroundings are some of the most wonderful views and some of the rarest wild animals in Turkey, including the Anatolian cheetah and some of Turkey’s last wild horses, The park is a wildlife preserve and a haven for many species of animals and birds. The exquisite Menderes River valley, known in the West as the Meander, has been the cradle of many civilisations. Set amidst pine, olive and oleander trees, the magnificent Çamiçi (Bafa) Lake is a lovely place to stopover. Tourists can choose between guest-houses or campsites. To the east of the lake rise the five peaks of the Besparmak Mountains. The Iconoclastic priests who came here to live, from Constantinople, built monasteries, churches, and chapels around the base of the mountains and on the lake’s islands. The ruins of the ancient city of Heraklia lie close to the lake, while the remains of Alinda are found on the eastern slopes of the Besparmak Mountains. The valley has witnessed the rise and fall of several great cities, notably Priene, Miletos, Didyma, Aphrodisias, and Hierapolis. This peaceful national reserve is an excellent place for bird-watchers, trekkers, nature-lovers and photographers. Güllübahçe (Priene) was one of the most active ports of the lonian Federation. The gridlike system of streets introduced in the fourth century B.C. by Hippodamos of Miletos is a superb and early example of town planning. Milet (Miletos), like Priene, was a great lonian port and the birthplace of several philosophers and sages. The theatre justifies a visit, and be sure to see the well-preserved ruins of the Faustina baths and the Archaeological Museum. Although Didim (Didyma) can only boast of a single monument, it is nevertheless a marvellous site. The Temple of Apollo was one of antiquity’s most sacred places. Many times looted and burned, the sanctuary still impresses with its elegant beauty. A portico of double colonnades surround the colossal temple. Not far from the archaeological site, the beautiful beach of Altinkum tempts with its many guest houses. Akbük is another holiday resort in the region with nice beach hotels. Although the history of Geyre (Aphrodisias) stretches back in time, the city, which was dedicated to Aphrodite, goddess of love and fertility, rose to prominence in the first century B.C. Some of the richest treasures of ancient times were uncovered in the excavations of this city. The public buildings are handsomely adorned with marble that was carved with astonishing skill, producing remarkable temples, monuments, baths, a theatre and a magnificent stadium. The reputation of the city’s craftsmen for the exquisite finesse of their statuary and marble sculpting spread through the civilised world, and Aphrodisias became the center of the greatest sculpting school of antiquity. Many of its marvellous works of art are now housed in the local museum. The theatre and bouleuterion are among the city’s best-preserved ruins. About 35 kilometres east of Aydın lies Sultanhisar, host to an Art and Culture Festival every spring. Nearby, in the quiet of the olive trees, are the ruins of ancient Nysa, famous in the second century A.D. as an educational centre. Nestled against high mountains near the Büyük (Meander) River is Denizli. Surrounded by the natural beauty of a verdant valley, the area is also rich in culture and history. The Luvians were the first inhabitants, followed centuries later by the Hittites. Throughout centuries, the fertile plain nourished other civilisations: The Phrygians, Lydians, Persians, Macedonians, Romans, Byzantines, Seljuks, and the Ottomans. Modern Denizli is a city of wide streets, parks and hotels. The Atatürk Ethnography Museum in the city center displays folk art and ethnic artifacts. While shopping in the Kaleiçi Çarsisi look for souvenirs of copper, jewellery, towels and silk blouses. You can choose among Çamlik, Incilipinar or Gökpinar Parks for a rest, picnic, or simply a walk through the forest in the shade of pine trees. The fresh water springs and thermal baths attract many visitors. A magical and spectacular natural site, unique in the world, Pamukkale (Hierapolis) is a fairyland of dazzling white, petrified castles. Thermal spring waters laden with calcareous salts running off the plateau’s edge have created this fantastic formation of stalactites, cataracts and basins. The hot springs have been used since Roman times for their therapeutic powers. Both the thermal center with its motels and thermal pools, and the ruins of the ancient city of Hierapolis, are situated on the plateau. Another thermal center northwest of Pamukkale, Karahayit is known for its water’s high-iron content. Honaz Dagi National Park is 20 km east of Denizli, near the town of Honaz. Mt. Honaz is one of the most beautiful and highest peaks (2.528 m) in the Aegean region. It is covered with a gorgeous alpine forest. Early Christians settled on the northern slope; the name of this ancient site is Colossae, and remains of the settlement can be seen. The province of Muğla includes the famous holiday cities of Bodrum, Marmaris, Datça, Köycegiz and Fethiye. Beautiful resorts, comfortable hotels and motels, cozy guest houses, impressive ruins of past civilisations and magnificent ok here landscapes offer holidaymakers plenty of choice. Muğla, the province’s capital, lies inland and is known for its traditional vernacular architecture. In the village of Özlüce, a veritable open-air museum east of Muğla, is Turolian Park, where you can find fossils that are from 5 – 9 million years old. An impressive medieval castle built by the Knights of Rhodes guards the entrance to Bodrum’s dazzling blue bay, in which the Aegean and the Mediterranean Seas meet. The town’s charm is well-known, attracting a diverse population of vacationers who stroll along its long palm-lined waterfront, while elegant yachts crowd the marina. Not far from town, you can swim in absolutely clear, tideless, warm seas. Underwater divers, especially, will want to explore the numerous reefs, caves and majestic rock formations. The waters offer up multicoloured sponges of all shapes and sizes, octopi and an immense variety of other aquatic life. The reputation of Bodrum’s boat yards date back to ancient times, and today, craftsmen still build the traditional yachts: the tirhandil with a pointed bow and stern, and the gulette with a broad beam and rounded stern. The latter, especially, are used on excursions and pleasure trips, and in the annual October Cup Race. The yearly throng of visitors has encouraged small entrepreneurs to make shopping in Bodrum a delight. Leather goods of all kinds, natural sponges and the local blue glass beads are among the bargains to be found in the friendly little shops along the narrow, white-walled streets. Charming boutiques offer kilims, carpets, sandals and embroidery as well as original fashions in soft cotton. Bodrum has gained the reputation as the center of the Turkish art community with its lively, friendly and Bohemian atmosphere and many small galleries. This community has encouraged an informal day-time lifestyle and a night-time of excitement. The evenings in Bodrum are for sitting idly in one of the many restaurants, dining on fresh seafood and other Aegean specialities. Afterwards nightclubs (some with cabaret) and superb discos keep you going until dawn. Bodrum, known in ancient times as Halicarnassus, was the birthplace of Heredotus and the site of King Mausolus’s Tomb (4th century B.C. ), one of the Seven Wonders of the Ancient World. In the harbour, the Bodrum Castle, or the medieval castle of St. Peter, is a fine example of 15th century Crusader architecture, and has been converted into the Museum of Underwater Archaeology, with remains dating as far back as the Bronze Age. The stunning panoramic view from Göktepe, nearby, is much photographed by visitors to the museum’s second-century theatre. 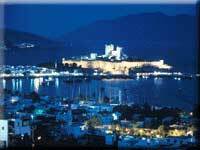 The beautiful Bodrum Peninsula suits holidaymakers interested in a subdued and relaxing atmosphere. Enchanting villages, with guest-houses and small hotels on quiet bays, dot the peninsula. On the southern coast, Bardakçi, Gümbet, Bitez, Aktur, Ortakent Yalisi, Karaincir, Bagla and Akyarlar have fine, sandy beaches Campers and windsurfers enjoy Gümbet, and at Bitez colourful sailboards weave skilfully among the masts of yachts in the bay. On shore, you can enjoy quiet walks through the orange and tangerine groves bordering the beach. Ortakent has one of the longest stretches of sandy beach in the area and offers an ideal place for relaxing in solitude. One of the most beautiful beaches on the Bodrum peninsula, Karaincir, is ideal for lively active days by the sea and relaxed, leisurely evenings with local villagers. Finally, Akyarlar enjoys a well-deserved reputation for the fine, powdery sand of its beach. Turgutreis, Gümüslük and Yalikavak, all with excellent beaches, lie on the western side of the peninsula and are ideal for swimming, sunbathing and water sports. In Turgutreis, the birthplace of a great Turkish admiral of the same name, you will find a monument honouring him. In the ancient port of Myndos (Gümüslük) you can easily make many friends with the hospitable and outgoing local population. In Yalikavak, white-washed houses with cascading bougainvillaea line narrow streets. Small cafes and the occasional windmill create a picturesque setting. See the north coast of the peninsula – Torba, Türkbükü, Gölköy and Gündogan – by road or, even better, hire a boat and crew to explore the quiet coves, citrus groves and wooded islands. Little windmills which still provide the energy to grind grain, crown hills covered with olive trees. Torba, a modern village with holiday villas and a nice marina is located 8 km north of Bodrum. Gölköy and Türkbükü are small and simple fishing villages with a handful of taverns overlooking a lovely bay. After a boat trip to Karaada, half an hour from Bodrum, you can bathe in the grotto where the warm mineral waters flowing out of the rocks are believed to beautify the complexion. The translucent and deep waters of the Gulf of Gökova, on the southern shore of the Bodrum peninsula vary from the darkest blue to the palest turquoise, and the coastline is thickly wooded with every hue of green. In the evening, the sea reflects the mountains silhouetted against the setting sun, and at night it shimmers with phosphorescence. You can take a yacht tour or hire a boat from Bodrum for a two, three or seven day tour of the gulf. The Gulf of Güllük, and harbour of the same name, lie north of the Bodrum peninsula on the Aegean. The mythological Dolphin Boy is said to have been born a little farther to the north at Kiyikislacik (lassos). South of Güllük, Varvil, ancient Bargilya, sits at the end of a deep narrow inlet surrounded by olive covered hillsides. Inland from Güllük is Milas, ancient Mylasa, known for its beautiful carpets – a century old tradition which continues today. The weavers rarely mind a visitor watching them at work. Plenty of old Turkish houses with carved timbers and latticed windows provide examples of the vernacular architectural style. Gümüskesen, a monumental tomb, thought to be a small copy of the famous Halicarnassus Mausoleum, stands in the west of the city. Situated on a bay, backed by rugged pine-clad mountains, Marmaris is one of the most attractive maritime parklands, ideal for water sports and sailing. It makes an excellent starting point for the “Blue Voyage” tour of the Aegean coastline. In May, the Marmaris Yacht Charter Show provides an opportunity to meet the yachts’ captains and crews. With plenty of provisions aboard, you set sail in the craft of your choice and languidly explore the spectacular beauty of southern Turkey. There are many good buys in Marmaris’ boutiques, colorful bazaars and markets. You can find excellent leather and suede goods, copper and brassware, jewellery and objects carved of onyx. Turkish carpets, textiles and embroidery make good handcrafted souvenirs, and the locally produced pine -scented honey called çambali is superb. Ancient Marmaris, Physkos, was an important stage on the Anatolia-Rhodes-Egypt trade route. In the 16th century Süleyman the Magnificent had a citadel built on a hill, the remains of which can still be seen today. Swimmers should not miss Atatürk Park, to the east of Marmaris, where a shallow beach, extending to the bay leads to safe waters. The clear sea is warm enough for swimming from early May until late September. Marmaris also has horseback riding and tennis centres for the sports enthusiast. This is one of the few places in the world where you can delight in the heady aroma of the frankincense tree. Weekly ferry lines run between Marmaris and Venice during the summer season. Near Marmaris at Içmeler, the hazy mountains of the interior slope down to sandy beaches. Under blue skies, the clear sea is ideal for all types of water sports. Many find this area so irresistible that they stay longer than originally planned. And there are some excellent accommodations here, in which you can prolong your contact with nature. As you drive down from the high mountains into the village of Turunç, the scene opens out onto the spectacular blue waters beyond the natural harbour. The village itself is small and scattered around the bay: Most of the restaurants border the beach. A few bars and restaurants farther back from the water’s edge offer fresh fish and superb views. Kumlubük, a turquoise paradise, lies on the southern side of the bay. On the northern side, above the water, stands the ancient Rhodian city of Amos. Loryma, at the tip of the Bozburun Peninsula, where the ruins of the ancient harbour and castle remain, can only be reached by boat. Natural quiet bays and scattered islands punctuate the northern shore of the peninsula, ideal for those who want to get away from it all. Sedir Island, in the Gulf of Gökova, is the ancient Cedrai. Its old city walls, theatre and temples can be visited by driving from Marmaris north to Gelibolu Bay and then crossing by boat. This voyage also offers an unforgettable panoramic view of the mountain scenery across the bay. At the head of the gulf is the village of Gökova Whose houses seem to cascade down the mountainside. Restaurants built over bubbling, fresh water streams that fall from the highlands create an ,unforgettable setting. The towering pines and cool breezes of Gökova Park are often a welcome respite from the hot sun. The Datça Peninsula provides a natural boundary between the Aegean Sea, the Gulf of Gökova to the north, and the Mediterranean Sea, the Gulf of Hisarönü to the south. Along all the 75 km from Marmaris to Datça, the road winds among trees and hills, permitting lovely views over the expanse of blue. Campers have many perfect settings to choose from; the less adventurous can stay in one of the many comfortable holiday villages. 25 km to Datça is the beautiful Aktur beach. In Datça white-washed buildings hung with bougainvillaea decorate the town. The marina is on the southern bay; while swimmers prefer the northern bay. Around the marina bars, cafes and a wide selection of shops keep the tourist interested. Some shops remain open well into the evening. Relaxing over a pre-dinner drink and then a delicious meal in a welcoming restaurant is a popular way to spend the evening hours. Of course, the local eateries offer both fresh fish and classical Turkish cuisine. With any remaining energy, take a stroll and find a disco to your liking to while away until the early morning hours. 10 km north of Datça, the Körmen Harbour is connected to Bodrum by a daily ferry line. As you travel out of Datça, either by road or by boat, you will find unspoilt bays and golden sandy beaches. Kargi is one of the most popular bays in the region. At the end of the peninsula (38 km from Datça) stands the ancient Carian city of Knidos, described by Strabo as “a city that was built for the most beautiful of goddesses, Aphrodite, on the most beautiful of peninsulas.” Famous as a center of art and culture in the fourth century B.C. the city had two harbours: one on the Aegean and the other on the Mediterranean. The remains of a circular temple dedicated to the goddess of love overlook the two harbours; the arcaded way was built of white marble, heart-shaped columns. The legendary Aphrodite of Praxiteles’ statue, one of the most beautiful sculptures of antiquity, once graced this temple. The town of Köycegiz lies at the northern end of a lake of the same name and Is joined to the Mediterranean by a natural channel. This unique environment is being preserved as a nature and wildlife sanctuary. A road shaded with aromatic frankincense trees leads to the tiny village of Dalyan on the inland waterway. The maze of channels is easily explored by boat as you immerse yourself in this tranquil dream world. The restaurants which line the waterways specialise in delicious meals of fresh fish. High on the cliff face, at a bend in the river, above the fascinating ancient harbour city of Caunos, magnificent tombs were carved into the rock. The Dalyan Delta, with a long, golden sandy beach at its mouth, is a nature conservation area and a refuge for sea turtles (Caretta Caretta) and blue crabs. At Ekincik, a delightful yacht mooring, you can enjoy the breathtaking beauty of this area. Only a half hour’s drive from Dalaman Airport, Sarigerme has wonderful sandy beaches, and a pleasant holiday village discreetly situated in a pine forest. The Dalaman River is the best for rafting and the best time for rafting is between May and October. The road to Fethiye winds up and down hills through a heavily forested region that offers occasional glimpses of the sea and an islet or two basking in total seclusion. The Gulf of Göcek and its friendly marina is one of the Mediterranean’s best sailing spots. Dotted with islands and indented with many coves, its land and seascapes are irresistible. The ruins of Arymaxa, an ancient city at the southern tip of the guff, lie at the edge of the azure waters. Opposite, on Tersane Island, stand Byzantine ruins, including those of the ancient shipyards. The popular resort Fethiye, 135 km southeast of Marmaris, boasts an important marina at the head of a beautiful bay strewn with islands. A hill crowned by the ruins of the crusader fortress built by the Knights of Rhodes overlooks the little port. Above the town, (called Telmessos in antiquity), numerous Lycian rock tombs, reproducing the facades of ancient buildings, were cut into the cliff face. The Tomb of Amyntas, which probably dates from the fourth century B.C. is the most remarkable. Swimmers head for the popular Çalis Beach, four kilometres west of town, or to Sövalye Island, opposite the harbour, which blazes with flowers in the spring. The road to Belcegiz Bay takes you through the mountains where cozy guest houses cater to those seeking mountain scenery. Ocakköy is the mountain village that is a must see, stay in one of the lovely guest houses, and enjoy the numerous trekking possibilities. Hisarönü, also in the mountains, has very nice hotels. 4 km from Hisarönü, Kayaköy is a picturesque ghost town of old houses and churches – all empty. Explore the bay and the beautiful Blue Lagoon, Ölü Deniz, where the calm, crystal clear water is ideal for swimming and other water sports. The Blue Lagoon is one of the best places in the world to do absolutely nothing except soak up the sun amid stunning natural surroundings. At Mt. Baba (1,969 m), you can paraglide into the Blue Lagoon. For those who’ prefer accommodation facilities, Belcegiz beach is recommended. Intoxicating scenery surrounds Kidirak’s beach and shady park. On Gemiler Island (St Nicholas’s Island), Byzantine ruins lie tucked among the pines. South of Kidirak beach, Kötürümsü Bay is reachable only by boat. Beyond the idyllic beach, a forest, waterfalls and a valley filled with hundreds of varieties of butterflies await the explorer. High in the mountains above Fethiye rushing torrents cut a narrow gorge through the mountains, creating Saklikent (Hidden City). A cool refuge on hot summer days, Saklikent is a favourite picnic spot, with rustic restaurants serving delectable fresh trout. 36 km south of Fethiye, Yakaköy (Tlos) is the Oldest city in the Lycian region. The home of the Lycian Hero Bellerophon, visitors can see the remains of a castle, agora, necropolis, theatre, Roman baths and a good view of Esen Valley. 2 km east of the villages is Tlos Park, ideal for picnicking. Pinara, 49 km south of Fethiye, is another ancient mountain city; it is ideal for trekking and visitors can see the remains of a theatre, agora, rock tomb, baths and ancient brothels.